Asistencia Asesoría y Administración (AAA) has several decorated luchadors with their talented skills and remarkable lucha masks that has become a symbol of Mexican wrestling. 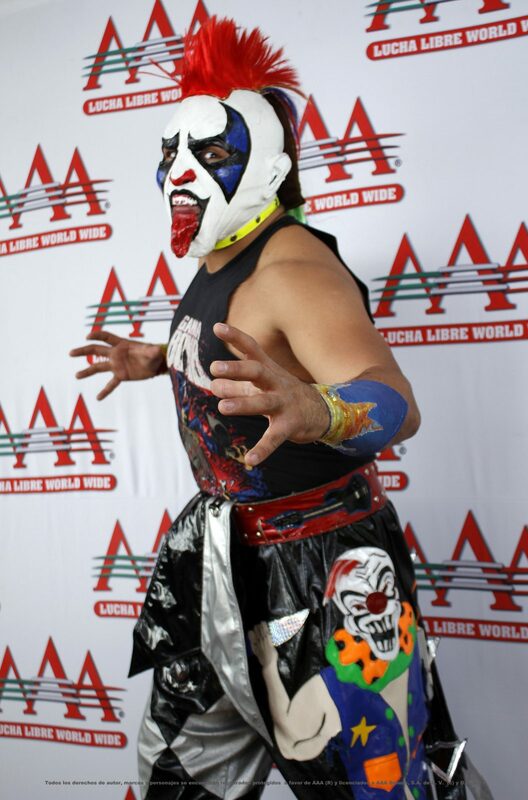 Psycho Clown is one of those figures who has been wrestling for several years in Mexico holding on to a record 600 match win streak, while wearing a different type of masks unlike his counterparts. The Roman Show caught up with the luchador for a one-on-one interview, who says he wants to become an international star and he is confident his skills could get him there. 1-Last year, you competed for individually for the Triple A Latin American championship. How different has the competition been individually compared to competing in the trios competition? Definitely, thanks to the support from the fans and Triple A, I decided to compete in different styles of lucha like singles and the same ones with the Psycho Circus group with Murder and Monster Clown. Rivals I have faced, both in singles and trios are tough and that forces me to use my experience and confront them and move forward. Right now, with my experience, I think I am a lethal weapon individually just like I am with the trios competition. 2-You think it is a matter of time till we see more lucha libre action in the United States thanks to programs like Lucha Libre Underground and Triple A that air television programming in English? I think soon we will see more Mexican lucha not only in the United States, but all over the world because the people can follow us through the internet no matter where you are. Triple A is international and obviously its priority is to conquer the United States fans since they can count on the best lucha libre today. Obviously this represents a major advantage for us, since one of my goals is to become an international star. 3-The Psycho Circus use different lucha masks compared to the traditional ones. How have you become used to it and did you ever doubt yourself using it? I never doubted myself using it. I’ll be honest, it was hard to breath at first since inside it has material difficult to breathe from and outside it has latex. Now, it feels like it is part of my own skin. 4-You have a record of winning 600 matches consecutively. How do you feel to hold that record and do you think someone can break the record one-day or tie it? Staying undefeated for three years isn’t easy especially since I wrestled excellent luchadors both nationally and internationally. 5-What is the future for the Psycho Circus? We want to keep forming the team and be victorious like best trios group of all time. We are convinced that we can have successful singles career to win more experience and keep collecting masks and head of our rivals. 6-How do you feel about wrestling Doctor Wagner, a legend in Mexican lucha libre? I have always had respect the hierarchy within lucha libre, but this doesn’t change and at the same time there was admiration and respect, but he finished with it all. He betrayed my trust and for that I advise him to prepare. I have decided to finish with his career. 7- Anything else you would like to add? Thank you to all of my fans and my home at Triple A and the media that trusts Psycho Clown.